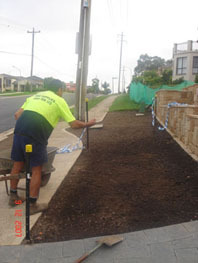 To ensure that your new turf grows as desired, the ground surface preparation is of utmost importance. Any drainage problems and soil levels need to be considered at this stage. Any weeds present on the ground cover should be sprayed to eliminate the chances of them resurfacing when your new lawn has been laid. The time lapse between spraying and laying the turf should be a minimum of 14 days. 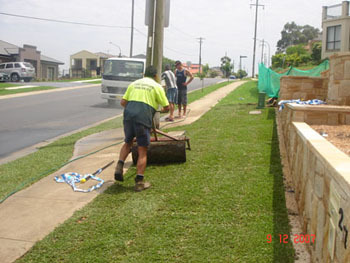 When spraying for weeds, utmost care must be taken and correct guidelines when using chemical sprays must be followed. This includes proper mixing, using the right equipment and disposal of any waste materials in the appropriate manner. After these points have been considered and prior to laying the turf, a good quality turf underlay should be spread evenly over the ground at a thickness of approximately 50mm. The underlay should consist of good quality washed river sand and top soil mixed together. Ensure that the soil level is 30mm below footpaths and driveway levels, to allow for the laying of your turf. This can be done manually using a rake, shovel and wheelbarrow, or you can employ the services of a bobcat operator to spread it for you. If you wish to use your existing soil, you need to ensure that the PH level of your soil is at the right level, then you may wish to rotary hoe the ground. Do ensure that you have a good soil base as this will have a bearing on the final outcome of your turf. 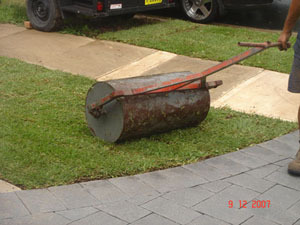 How you water your lawn will have a large bearing on the final outcome of its appearance. At this stage you may wish to install a sprinkler system beneath your soil, (DRIP IRRIGATION) or alternatively employ the services of a landscaper to do it for you. A good starter fertiliser can be applied at this stage, to boost the establishment of your new lawn. You may also wish to consider spreading some water crystals on the soil, prior to laying your new turf, to help with water retention, during the drier seasons of the year. These can be purchased from your local nursery. completion of the job, to ensure a smooth and level finish.